Valeriya Gonitashvili is a 19 years old Crimean refugee, currently living in Georgia. She works as an editor for Georgian Journal weekly newspaper and as a private tutor in English and Russian languages. 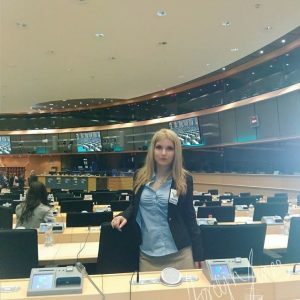 She is an active citizen in social and political life, being a member of the Ukrainian NGO „Svitanok“ in Georgia and communications manager of Thomas Jefferson research centre and Polish Fundation „Ambitna Polska“.